The book I reprint here is an initiation to the Path, as well as detailed instructions how to learn about the deeper meaning of meditation, because the practice of meditation is two-fold: 1) we sit and meditate, 2) we walk the Path ... you shall learn that the Path contains directions as to how to live truthfully and with compassion. Allow me to point out that I had a similar initiation in 1987; I write about my experience with the Master in my essay Q & A in my book en.light.en.ment. 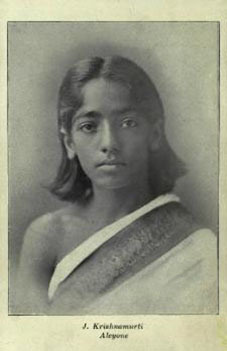 Jiddu Krishnamurti is said to have written this book when he was fourteen years old, in 1909. 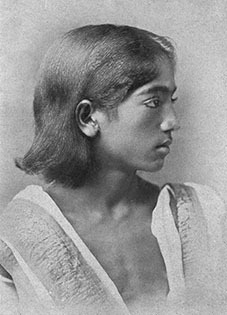 It served to convince Annie Besant of the Theosophical Society to see in K the contemporary messiah, the World Teacher. I deem it a wonderful text where K channels his own Master's wisdom; teachings that outline the Path in great detail. The link below takes you to the original essay, published in 1910. It is about 6,500 words and takes approximately a couple of hours to read. Below that is a version I have abridged, it is about 3,000 words, a half-hour to an hour read. However, if you accept the premise contained in the essay, you'll spend the rest of your life walking the Path ... in my book en.light.en.ment I added a new essay THE PATH. There is an instructive new website The Life of Krishnamurti, published by the Krishnamurti Foundation of America (KFA). A note as to the definition of the term God. In Indian society seekers for knowledge, who are initiated by a Master - and this essay in principle is such an initiation - see their Master not only as servant to God, but they see God in their Master. Other than in this context, as K talks of God, he refers to the spirit within each of us; says he: "You must dig deep down into yourself to find God within you." These are not my words; they are the words of the Master who taught me. Without Him I could have done nothing, but through His help I have set my feet upon the Path. The words which He spoke to me will help you also, if you will obey them. It is not enough to say that they are true and beautiful; a wo/man who wishes to succeed must do exactly what is said. The first of these qualifications is Discrimination, and this is usually taken as the discrimination between the real and the un-real which leads wo/men to enter the Path. It is this, but is also much more; and it is to be practiced, not only at the beginning of the Path, but at every step of it every day until the end. In all the world there are only two kinds of people - those who know, and those who do not know; and this knowledge is the thing which matters. What religion a wo/man holds, to what race s/he belongs, these things aren’t important; the really important thing is this knowledge. Discrimination is the first step and you must remember that of the real and the unreal there are many varieties, and discrimination must be made between the right and the wrong, the important and the unimportant, the useful and the useless, the true and the false, the selfish and the unselfish. Between the right and wrong it should not be difficult to choose. At whatever apparent cost, that which is right you must do, that which is wrong you must not do, no matter what the ignorant may think or say. You must study deeply the hidden laws of nature, and when you know them arrange your life according to them, using always reason and common sense. Be firm as a rock where right and wrong are concerned, yield always to others in things which do not matter. For you must be always gentle and kindly, reasonable and accommodating, leaving to others the same full liberty which you need for yourself. To feed the poor is a good and noble and useful work; yet to feed their souls is nobler and more useful than to feed their bodies. Any rich wo/man can feed the body, but only those who know can feed the soul. If you know, it is your duty to help others to know. However wise you may be already, on this Path you have much to learn; so much that here also must be discrimination, and you must think carefully what is worth learning. All knowledge is useful, and one day you will have all knowledge; but while you have only part, take care that it is the most useful part. God is Wisdom as well as Love; and the more wisdom you have the more you can manifest of Him, but you must dig deep down into yourself to find the God within you. Study then, but study first that which will most help you to help others. Work patiently at your studies, not that wo/men may think you wise, not even that you may have the happiness of being wise, but because only the wise wo/man can be wisely helpful. However much you wish to help, if you are ignorant you may do more harm than good. You must distinguish between truth and falsehood; you must learn to be true all through, in thought and word and deed. Therefore you must not hold a thought just because many other people hold it, nor because it has been believed for centuries, nor because it is written in some book which man thinks sacred; you must think of the matter for yourself, and judge for yourself whether it is reasonable. Those who would walk upon the Path must learn to think for themselves, for superstition is one of the greatest evils in the world, one of the fetters from which you must utterly free yourself. Your thought about others must be true; you must not think of them what you do not know. Do not suppose that they are always thinking of you. If a wo/man does something which you think will harm you, or says something which you think applies to you, do not think at once: "S/he meant to injure me." Most probably s/he never thought of you at all, for each soul has its own troubles and its thoughts turn chiefly around itself. You must be true in speech too - accurate and without exaggeration. Never attribute motives to another; s/he may be acting from reasons which have never entered your mind. If you hear a story against any one, do not repeat it; it may not be true, and even if it is, it is kinder to say nothing. Think well before speaking, lest you should fall into inaccuracy. Be true in action; never pretend to be other than you are, for all pretense is a hindrance to the pure light of truth, which should shine through you as sunlight shines through clear glass. Desirelessness: There are many for whom the qualification of Desirelessness is a difficult one, for they feel that they are their desires - that if their distinctive desires, their likings and dislikings, are taken away from them, there will be no self left. Discrimination has already shown you that the things which most wo/men desire, such as wealth and power, are not worth having; when this is really felt, not merely said, all desire for them ceases. Thus far all is simple; it needs only that you should understand. When all desires for self are gone, there may still be a desire to see the result of your work - you must do right for the sake of the right, not in the hope of reward. You must guard, too, against certain small desires which are common in daily life. Never wish to shine, or to appear clever; have no desire to speak. It is well to speak little; better still to say nothing, unless you are quite sure that what you wish to say is true, kind and helpful. Another common desire which you must sternly repress is the wish to meddle in other’s business. What another wo/man does or says or believes is no affair of yours, and you must learn to leave them absolutely alone. S/he has full right to free thought, speech and action, so long as s/he does not interfere with any one else. You yourself claim the freedom to do what you think proper; you must allow the same freedom to them, and when s/he exercises it you have no right to talk about them. Self-control as to the Mind means the control of temper, so that you may feel no anger or impatience; of the mind itself, so that the thought may always be calm and unruffled; and that you may be as little irritable as possible. This last is difficult, but you must do your best. The calm mind means also courage, so that you may face without fear the trials and difficulties of the Path; it means also steadiness, so that you may make light of the troubles which come into every one's life, and avoid the incessant worry over little things in which many people spend most of their time. The Master teaches that it does not matter in the least what happens to a wo/man from the outside; sorrows, troubles, sicknesses, losses - all these must be as nothing to you, and must not be allowed to affect the calmness of the mind. They are the result of past actions, and when they come you must bear them cheerfully, remembering that all evil is transitory, and that your duty is to remain always joyous and serene. They belong to your previous lives, not to this; you cannot alter them, so it is useless to trouble about them. Think rather of what you are doing now, which will make the events of your next life, for that you can alter. Never allow yourself to feel sad or depressed. Depression is wrong, because it infects others and makes their lives harder, which you have no right to do. Therefore if ever it comes to you, throw it off at once. In yet another way you must control your thought, you must not let it wander. Whatever you are doing, fix your thought upon it, that it may be perfectly done; do not let your mind be idle, but keep good thoughts always in the background of it, ready to come forward the moment it is free. Hold back your mind from pride, for pride comes only from ignorance. Self-control in Action: If your thought is what it should be, you will have little trouble with your action. Yet remember that, to be useful to mankind, thought must result in action. There must be no laziness, but constant activity in good work. But it must be your own duty that you do - not another wo/man's, unless with their permission and by way of helping them. Leave every wo/man to do their own work in their own way; be always ready to offer help where it is needed, but never interfere. For many people the most difficult thing in the world to learn is to mind their own business, but that is exactly what you must do. Tolerance: You must feel perfect tolerance for all, but in order to gain this perfect tolerance, you must yourself first be free from bigotry and superstition. Look kindly, gently, tolerantly upon all; but upon all alike, Buddhist or Hindu, Jain or Jew, Christian or Muslim. Cheerfulness: You must bear your karma cheerfully, whatever it may be, taking it as an honor that suffering comes to you, because it shows that the Lords of Karma think you worth helping. However hard it is, be thankful that it is no worse; in order to make the best out of it, you must bear it cheerfully, gladly. Yet another point. You must give up all feeling of possession. Karma may take from you the things which you like best - even the people whom you love most. Even then you must be cheerful - ready to part with anything and everything. Cheerfulness must be the rule. One-pointedness means that nothing shall ever turn you, even for a moment, from the Path upon which you have entered. No temptations, no worldly pleasures, no worldly affections even, must ever draw you aside. For you yourself must become one with the Path; it must be so much part of your nature that you follow it without needing to think of it. You have decided it; to break away from it would be to break away from yourself. Confidence: You must trust yourself. You say you know yourself too well? If you feel so, you do not know yourself; you know only the weak outer husk, which has fallen often into the mire. But you - the real you - you are a spark of God's own fire, and God is in you, and because of that there is nothing that you cannot do if you will. Your will must be like tempered steel, if you would tread the Path. Love: Of all the qualifications, Love is the most important. In daily life this means two things; first, that you shall be careful to do no hurt to any living thing; second, that you shall always be watching for an opportunity to help. First, to do no hurt. Three sins there are which work more harm than all else in the world: Gossip, cruelty, and superstition, because they are sins against love. See what gossip does. It begins with evil thought, and that in itself is a crime. For in everyone and in everything there is good; in everyone and in everything there is evil. 1 - You are filling your neighbourhood with evil thought instead of with good thought, and so you are adding to the sorrow of the world. 2 - If there is in that wo/man the evil which you think, you are strengthening it and feeding it, and so you are making your sister or brother worse instead of better; but generally the evil is not there, and you have only fancied it, and then your wicked thought tempts them to do wrong, for if s/he is not yet perfect you may make them that which you have thought them. 3 - You fill your own mind with evil thoughts instead of good; and so you hinder your own growth, and make yourself, for those who can see, an ugly and painful object instead of a beautiful and lovable one. Not content with having done all this harm to themselves and to their victim, the gossip tries with all its might to make others partners in their crime. Eagerly s/he tells their wicked tale to them, hoping that they will believe it; and then they join with them in pouring evil thought upon the poor sufferer. And this goes on day after day, and is done not by one wo/man but by thousands. Do you begin to see how base, how terrible a sin this is? You must avoid it altogether. Never speak ill of any one, refuse to listen when any one else speaks ill of another, but gently say: "Perhaps this is not true, and even if it is, it is kinder not to speak of it." Then as to cruelty. This is of two kinds, intentional and unintentional. Intentional cruelty is purposely to give pain to another living being, and that is the greatest of all sins - the work of a devil rather than man. You would say that no wo/man could do such a thing, but man has done it often, and is daily doing it now. The inquisitors did it, many religious people did it in the name of their religion. All these people try to excuse their brutality by saying that it is the custom; but a crime does not cease to be a crime because many commit it. Karma takes no account of custom; and the karma of cruelty is the most terrible of all. There can be no excuse for such customs, for the duty of harmlessness is well-known to all. The fate of the cruel must fall also upon all who go out intentionally to kill God's creatures, and call it "sport." Such things as these you would not do, I know; and for the sake of the love of God, when opportunity offers, you will speak clearly against them. But there is a cruelty in speech as well as in act; and a wo/man who says a word with the intention to wound another is guilty of this crime. That, too, you would not do; but sometimes a careless word does as much harm as a malicious one. So you must be on your guard against unintentional cruelty. It comes usually from thoughtlessness. Man is so filled with greed and avarice that s/he never even thinks of the suffering which s/he causes to others. Yet others thinks only of their own lust, and care little how many souls and bodies s/he ruins in satisfying it. But karma never forgets, and it takes no account of the fact that man forgets. If you wish to enter the Path, you must think of the consequences of what you do, lest you should be guilty of thoughtless cruelty. Superstition is another mighty evil, and has caused much terrible cruelty. The wo/man who is a slave to it despises others who are wiser, tries to force them to do as s/he does. Think of the treatment which superstition has meted out to the depressed classes, and see in that how this evil quality can breed heartless cruelty even among those who know the duty of brotherhood. Many crimes has man committed in the name of the God of Love, moved by this nightmare of superstition; be very careful therefore that no slightest trace of it remains in you. These three great crimes you must avoid, for they are fatal to all progress, because they sin against love. But not only must you thus refrain from evil; you must be active in doing good. You must be so filled with the intense desire of service that you are ever on the watch to render it to all around you - not to man alone, but even to animals. You must render it in small things every day, that the habit may be formed, so that you may not miss the rare opportunity when the great thing offers itself to be done. For if you yearn to be one with God, it is not for your own sake; it is that you may be a channel through which His love may flow to reach your fellow man. S/he who is on the Path exists not for themselves, but for others; at the same time s/he is also a living plume of fire, raying out upon the world the Divine Love which fills their heart. The wisdom which enables you to help, the will which directs the wisdom, the love which inspires the will - these are your qualifications. Will, Wisdom and Love are three aspects of the Logos; and you, who wish to enroll yourselves to serve, must show forth these aspects in the world.